KA47 ad­apter is used in­stead of a rib­bon cable to con­nect SD card read­er with IDE in­ter­face to Amiga IDE port. 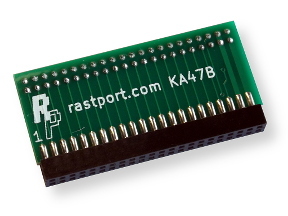 KA47 is de­signed for Amiga 600 and Amiga 1200. Ac­tive cor­rec­tion of HDD LED sig­nal for Amiga. 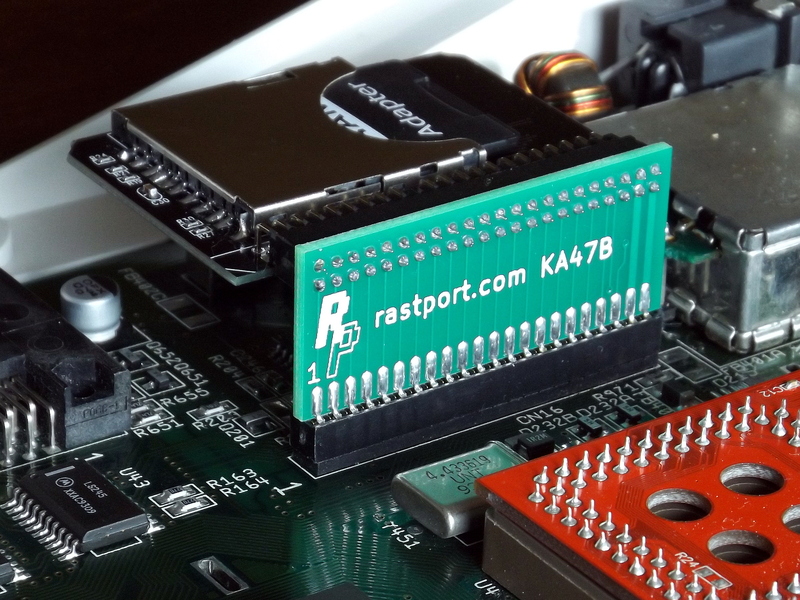 No more prob­lems with LED being al­ways on. Rigid and durable con­struc­tion. 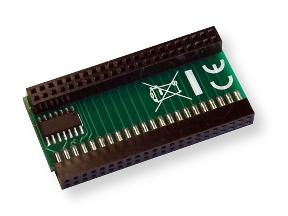 No ad­di­tional mount­ing of SD2IDE re­quired. 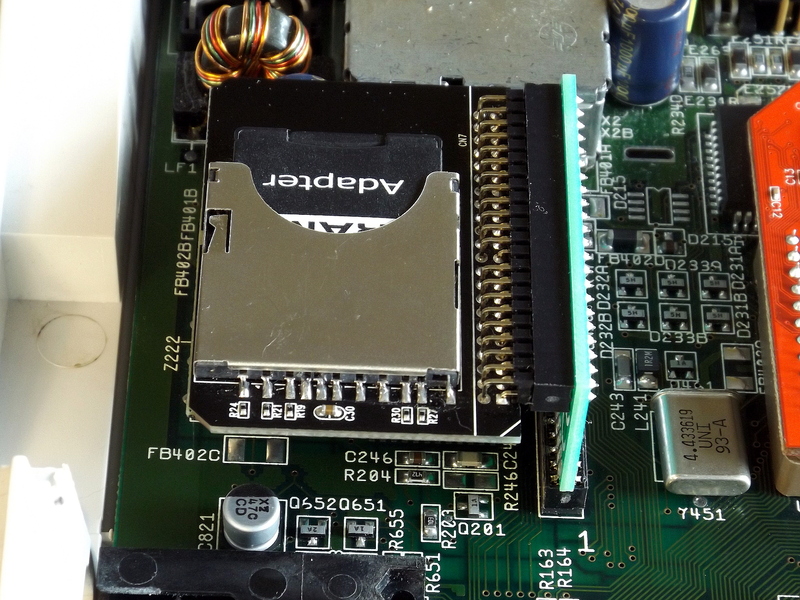 SD2IDE reader is mounted with SD card up. One can change the card with­out dis­mount­ing the reader. 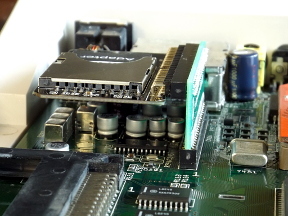 SD2IDE reader is on the left of the Amiga IDE port. Space on the right is free for scan­dou­bler or other ex­pan­sions. 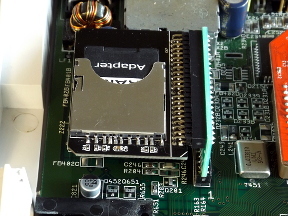 Adapter does not fit into Amiga with upper shield cover in­stalled. This webpage does not store cookies or any other data on your computer. This webpage does not collect any data related to visitors. WWW server of the hosting operator maintains standard access logs. They contain time of access, your IP address, browser identification (User-Agent), requested URL, request result and number of bytes sent. RastPort does not process these data. They can be processed by the hosting operator for traffic statistics and in case of attacks on operator infrastructure.